HEY kids, wanna play a game of green shirts and baddies? NPower, the electricity people, want you, the Britisher Jungvolk, to inform on your mums and your dads if they disobey the rules on climate change. Grab a gas mask, a tin hat and come closer. Baroness Young of Old Scone, head of the Environment Agency, says climate change is “World War Three”. And in zer war you want to be on the side of the good guys, right kidz? We vill take ze moral highground, and victory will be ours. We believe in climate change. We want to stamp it out. But some are resistant to our word. Say “global warming” to them and if they could grab a gun and shoot you in the throat, they would. These people are dangerous. If only they could see climate change they’d know how terrible it was. For argument’s sake, let’s say climate change is a hook-nosed, long-fingered, bearded kiddie-messer called Abraham. He wants to drink your blood and then rinse his plate in the dishwasher. You are the planet’s kinder Kinder. 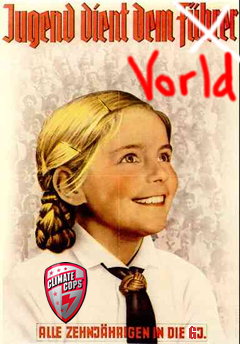 You are the climate cops. You can neutralise climate change. Only you can save the planet. You a Contra-arayan? Change begins at home. Observe mother and father and list their crimes in a journal. CLIMATE CRIME: “Leaving a tap running! CLIMATE CRIME: not using energy-saving light-bulbs. A team of spotters will enter all the UK’s dwellings under the guise of being “cubs”, “friends” or looking for a tommy ball knocked over a fence. Once inside you will set about looking for non energy–saving light bulbs. The homes of non believers will be sprayed on the front door’s lintel with a yellow paint only visible to the eyes of the righteous. When all properties have been logged, teams of the enlightened will go from house to house smashing the glass.